My Argentum RTW and MTO lines are the first shoes that I have offered to be sold directly through my online store. These shoes are the best that I can make at the price and they offer several innovations and advantages over most ready to wear shoes. After several years of receiving orders by email, and seeing that not every person was ready to commit to a handmade shoe, I began thinking about how to offer the greatest benefit of a handwelted shoe at a reasonable price. After surveying the marketplace and seeing what types of shoes are offered at various price points, I decided create a shoe that offered much of the benefits of a handwelted shoe at a cost effective price. 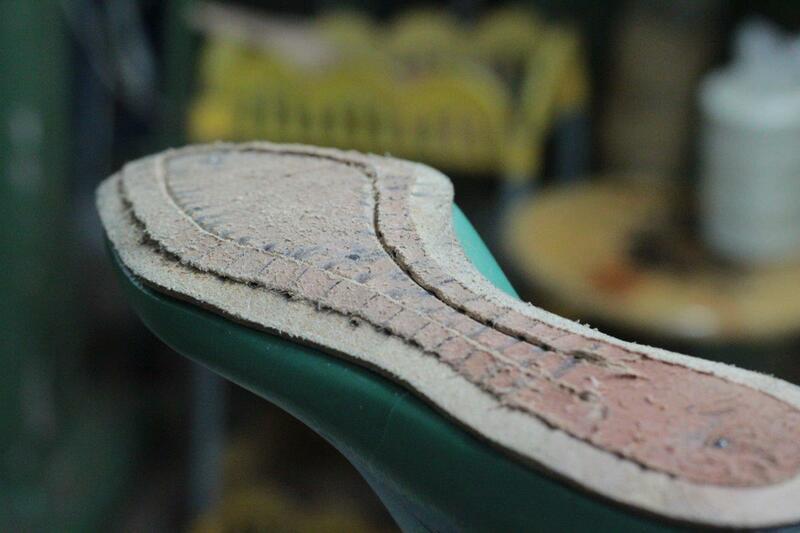 The most important part of any handwelted shoe is the leather insole (the part of the shoe where your foot rests). This is the backbone of the shoe where the upper, welt, and sole (via the welt) is attached to. 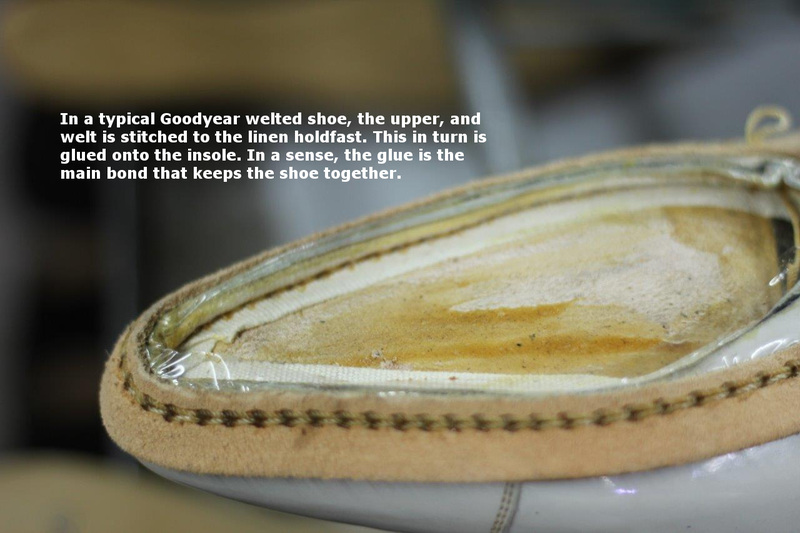 In most Goodyear welted shoes, the upper, and welt are stitched to a strip of linen called a holdfast. 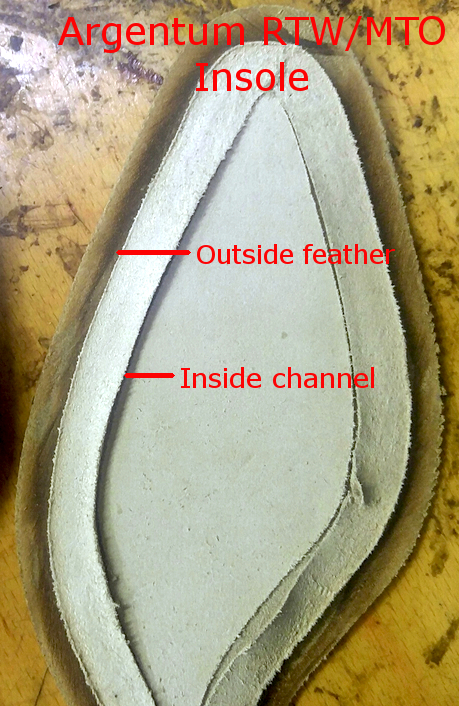 This holdfast is attached to the insole by glue. In a sense, the integrity of the shoe is based on the strength of the bond of the glue from the insole to the linen feather. 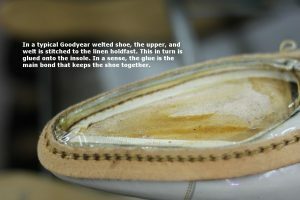 The insole of a mass produced Goodyear welted shoe does not have to be as thick as the insole of a handwelted shoe because there is no need for it to be. to which the upper and welt is stitched to, and secondly to create a footbed for the foot. 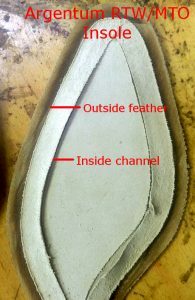 As can be seen from the photo, the insole in a handwelted shoe is the spine to where the rest of the shoe is attached to. There is no glue interface that can fail, it is a direct leather to leather connection. 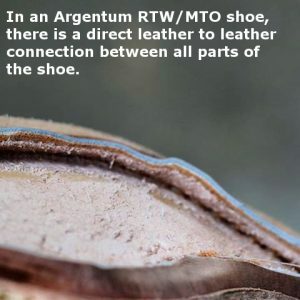 I call the system I use to make my Argentum rtw/mto shoes the “Argentum welted construction”* and I believe it is a superior construction method compared to Goodyear. My shoes utilize no linen holdfast and thus no glue. 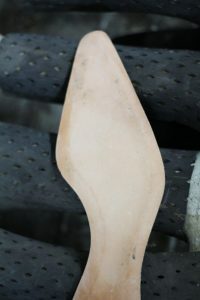 There is a direct leather to leather connection from the insole to the upper and welt. 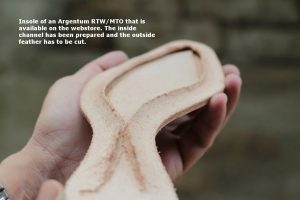 The insoles that I use for my Argentum rtw/mto shoes are the same thickness as those in my handwelted shoes; approximately 4-5mm. The difference is that the holdfast is carved by hand from the insole of a handwelted, while the holdfast is cut out by machine in my Argentum rtw/mto insole. In contrast to my Aurum and Argentum handwelted shoes, the upper and welt is stitched to the holdfast by machine instead of by hand. There is no risk of glue failure compromising the integrity of the shape and structure of the shoe (vs. a typical Goodyear welted shoe). 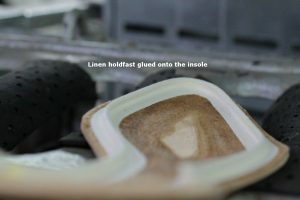 The insole is more flexible like that of a handwelted shoe, compared to a insole with a glued on linen holdfast (like those on a Goodyear welted shoe). 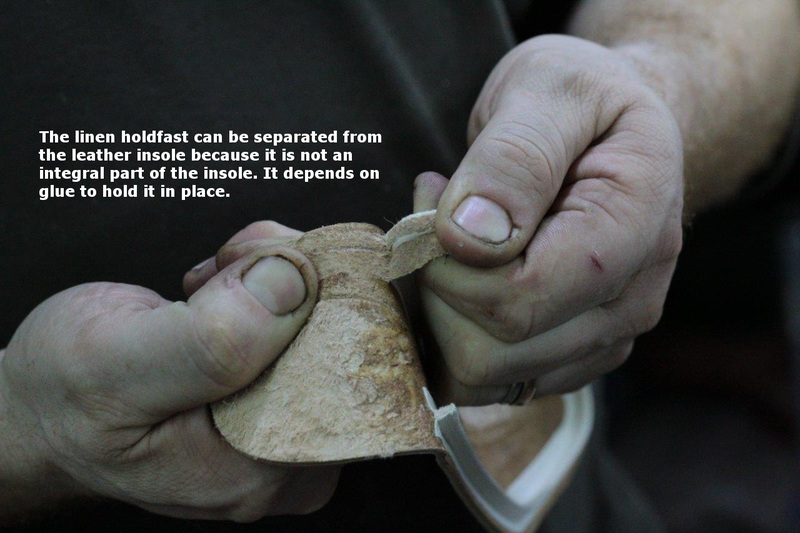 There is less filler needed inside the shoe because the holdfast is created from the insole, thus making it ligher. A glued on linen holdfast creates a gap that has to be filled in usually by a mixture of cork and glue. Compared to a Blake-Rapid stitched shoe, an Argentum rtw/mto can be repaired by any competent shoe repair store without needing specialized Blake machines or the original last of the shoe. It is more flexible and comfortable compared to a Blake-Rapid constructed shoe. A shoe that offers many of the benefits of a handwelted shoe at an accessible price. To view details of these shoes, please visit the Argentum RTW/MTO Gallery. To purchase these shoes, please click here. * My thanks to Master Bootmaker D.W. Frommer II for his suggestion of the name.